How many times have you turned the inside of a bowl to find a series of ridges? So, you think to yourself is it my technique, a badly cut spigot causing vibration, or is the lathe to blame? Most times, it is the bowl gouge that is leaving these marks. It is all down to the curves on the bowl and the bowl gouge. I am sure we have all had this problem when we start bowl turning. Either we work out why this happens or we ask for advice from other woodturners. This shows the ridges on the inside of a bowl. If you measure the distance between the ridges, it will normally be the length of the bevel on the bowl gouge. This will show up even more when you apply a finish and the light reflects off the ridges. Yes, this can be an interesting surface finish, but not if you want a smooth surface finish. You can also have small scratch marks as well; these are caused by the heel of the bowl gouge rubbing the bowl. This is the main problem that will cause ridges on the inside of a bowl. The bowl is concave and if you sharpen your bowl gouge on a normal grinder, this will leave your gouge with a concave bevel as well, and as your grinder wheel reduces in diameter, the concave will be more pronounced. I have cut this bowl in half to show that you have two concave surfaces. I will show you how to overcome this problem. This can be overcome with the grind on the gouge if you donâ€™t have more than one bowl gouge. 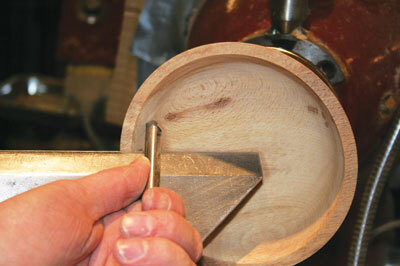 By using a gouge with a second bevel you reduce the amount of bevel contact with the bowl. 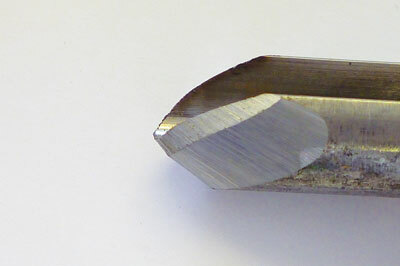 My bowl gouges are ground to 50 degrees at the tip of the tool, and then with a second bevel ground to 45 degrees. This second bevel which leaves only 3mm (1/8in) of the 50 degrees, means you have only a small bevel contact with the bowl and this will reduce the ridges. 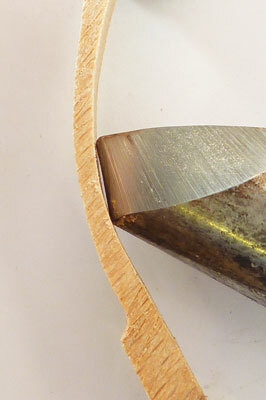 Using a small bowl gouge means that there is less bevel to rub on the bowl surface, thus causing less problems. 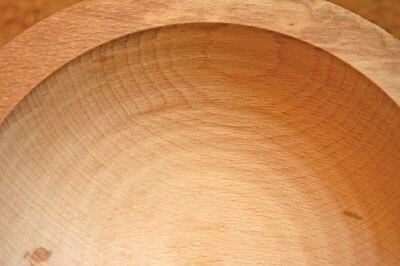 Again, just remove the heel at the base of the bevel to make sure this does not leave scratch marks on the bowl. The surface should be smooth now. This only requires a light pass with a scraper to remove any small marks and then you can move on to the sanding process.